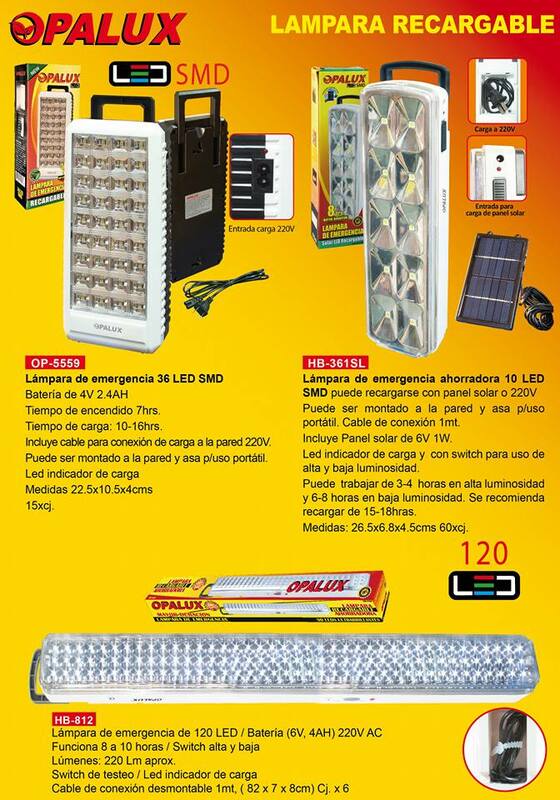 LÁMPARA DE EMERGENCIA AHORRADORA 10 LED SMD PUEDE RECARGARSE CON PANEL SOLAR O 220V. - PUEDE SER MONTADO A LA PARED Y ASA P/ USO PORTÁTIL . -CABLE CONEXIÓN 1 METRO. - INCLUYE PANEL SOLAR DE 6V 1W - LED INDICADOR DE CARGA Y SWITCH PARA USO DE ALTA Y BAJA LUMINOSIDAD. - PUEDE TRABAJAR DE 3 - 4 HRS ALTA LUMINOSIDAD Y 6-8 HORAS EN BAJA LUMINOSIDAD. SE RECOMIENDA RECARGAR DE 15-18 HRS. - MEDIDAS: 26.5 x 6.8 x 4.5 cms - SE DISTRIBUYE A PARTIR DE 60 UNID.